Empower your students to write first! PACKAGE THIS TITLE WITH OUR 2016 MLA SUPPLEMENT, Documenting Sources in MLA Style (package ISBN-13: 9781319088040). Get the most recent updates on MLA citation in a convenient, 40-page resource based on The MLA Handbook, 8th Edition, with plenty of models. Browse our catalog or contact your representative for a full listing of updated titles and packages, or to request a custom ISBN. Best-selling authors and veteran college writing instructors Laurie Kirszner and Stephen Mandell believe that students learn to write best when they use their own writing as a starting point. 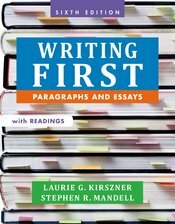 In Writing First with Readings: Paragraphs and Essays, the authors take a simple yet effective approach to helping students improve their writing skills: visual writing prompts open every chapter and get students writing immediately. Then, throughout the chapter, students move between their own writing, writing models and instruction, and workbook-style mastery exercises so that they continually revise, rewrite, and improve their own writing. It is this formula that makes writing instruction meaningful and accessible for students. Thoughtful chapters on academic writing and success, research, and critical reading, along with high-interest essays, round out this new edition, making it the perfect introduction to college writing. This edition can be packaged with LaunchPad Solo for Writing First, which includes LearningCurve, the adaptive online quizzing program with immediate feedback that 95% of students surveyed recommended to their peers. Additional online multiple-choice grammar exercises offer even more practice with the grammar concepts students find most challenging. Also included are four additional online readings with questions and assignments that encourage critical reading and thinking.